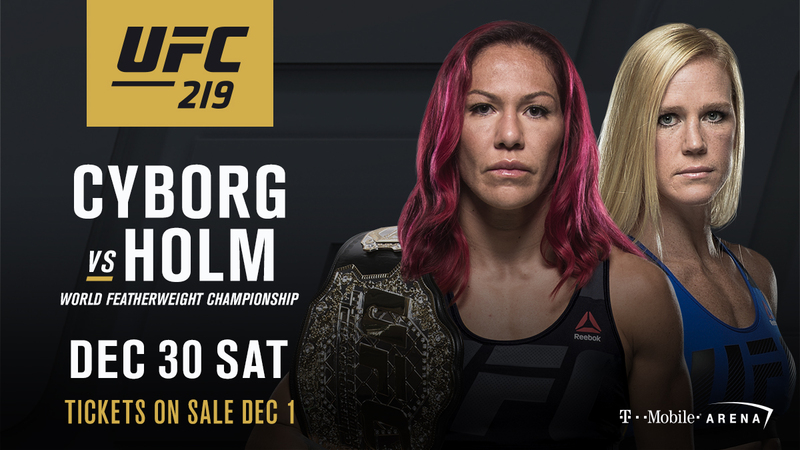 It's the dream fight fans have been waiting for, and on Saturday, Dec. 30, the UFC's final event of 2017 will see a battle between two of the greatest female fighters ever, as Cris "Cyborg" Justino defends her UFC women's featherweight title against Holly Holm at UFC 219 at T-Mobile Arena in Las Vegas. UFC 219 airs live on Pay-Per-View. Tickets go on sale December 1.
round finish of Tonya Evinger that extended her remarkable unbeaten streak to 19 heading into her showdown against Holm. bantamweight title. Holm would lose the belt to Miesha Tate, but in June of this year, she showed off her knockout form once more against Bethe Correia, and this December she will move to 145 pounds to face off with Cyborg.